This was actually my first time baking bread in a loaf pan, and the lesson learned was to grease more thoroughly next time (or acquire a non-stick or silicone pan). I couldn’t find a recipe that sounded just right, so I mixed some up, based largely on the pain ordinaire (fancy-speak for basic bread) in Ultimate Bread . I think I slightly overbaked, but the long process of getting it out of the dang pan may have been a factor there, too. 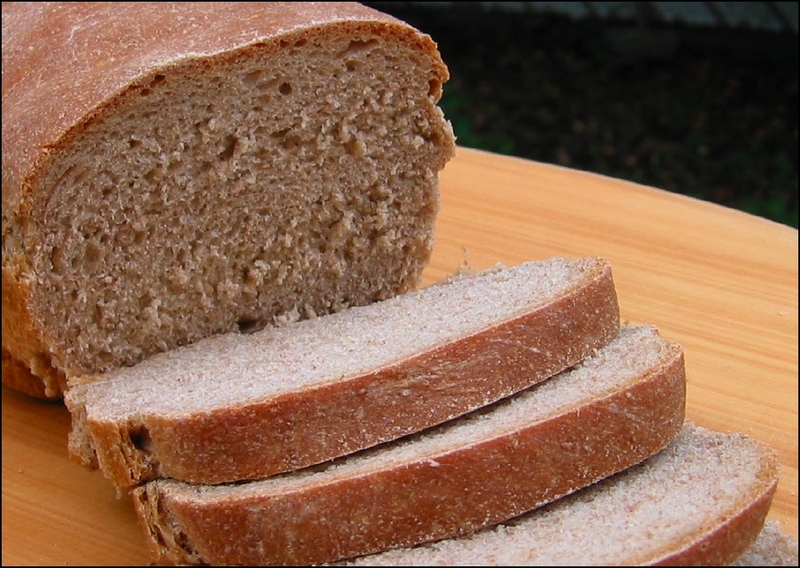 Although I called this whole wheat, like most whole wheat breads, there is still a fair bit of white flour. After a few days, I did what I always do with my sandwich bread and froze the remainder in slices. It toasts up beautifully from the freezer. Beware these cookies: they can be dangerous! Chewy, and delicious, and so rich, it’s hard to eat more than one or two at a time, but as soon as you’re able, you’ll want more. 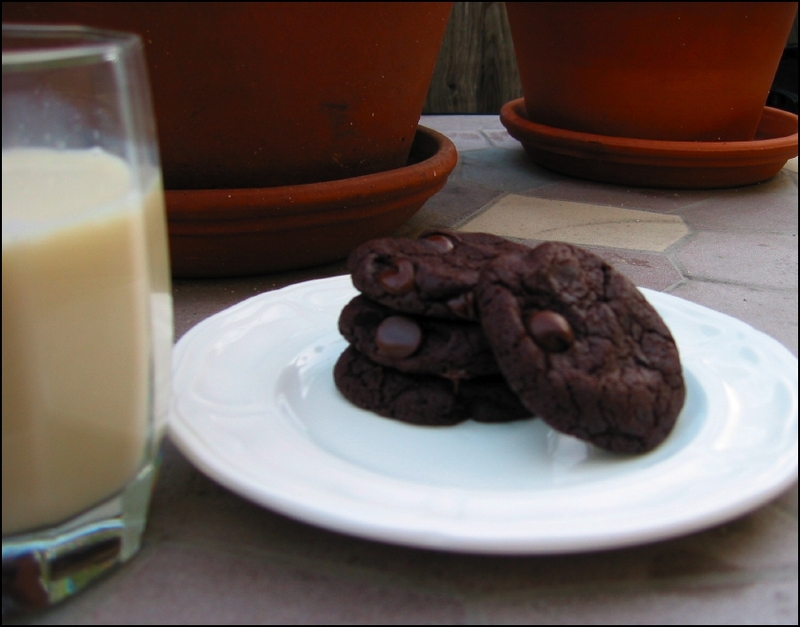 Another gem from Isa at The Post Punk Kitchen, the original calls for too much sugar (as do many of her recipes, but it’s a minor flaw that is easily corrected), but other than that, these cookies are pretty much perfect. I have no doubt one of the keys in these in particular being so yummy is the really good Dutch process cocoa that my roomie acquired at Amsterdam’s Schipol Airport during a layover. While I’m sure you could get yummy results with regular cocoa, it would throw off the acid balance and who knows what might happen. For about a month, I was getting a lot of corn with my farm share. Ah, those were the days! With 12-24 ears to work with, I could make anything. Anything! Well, anything involving corn. On the left is Chipotle Corn Soup (or maybe it needs a better name?) and is something I came up with. The first time, I just processed the corn raw, which was great, but I felt that roasting would really add depth so I wanted to try it that way, too. Then the second time, I didn’t roast because I was in a hurry. But after that, I took the time to grill the corn and really love the added smokiness. It’s great either way, though. On the right is a Bean, Corn, and Chili Soup from DD’s Stillman CSA newsletter that Mark made while they were both over. The recipe called for pinto beans, but he also used Great Northern. All the vegetables except garlic were from my or DD’s share (the cilantro and celery I’d frozen), with tomatoes and basil from the garden. Very different from the first soup, it was still delicious. 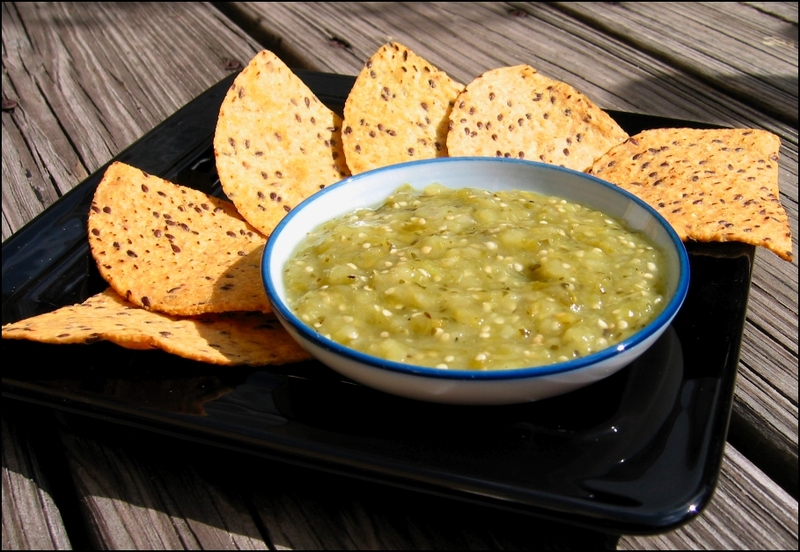 For a few weeks, we’ve been getting tomatillos in the farm share and, as strangely cool as these weird little things with their papery husks are, I didn’t really know what to do with them.Â OnceÂ had a couple of pints (which later turned into three), I knew something had to be done so I decided to use it all to make a big batch of salsa verde, aka green salsa, aka tomatillo salsa.Â Â Googling around turned up this recipe, which looked good to me so I stole it almost verbatim.Â As an added bonus, I usedÂ share cilantro that I’d previously frozen into ice cubes as well as share onions I’d chopped and frozen.Â It all worked out quite well. 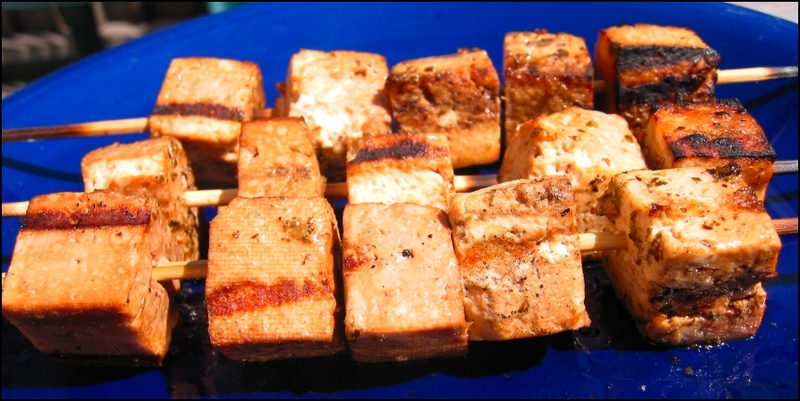 In addition to eating it with chips (shown are Trader Joe’s Flax Seed Tortilla Chips), I think it’d work very well over quesadillas or other spicy dishes.Â Last night, DD and I grilled some tempeh rubbed with a hot cajun mix and the salsa made for an excellent topping. I’ve been slack about the “On the Town” portion of this blog because I keep forgetting to bring my camera to and/or take pictures at relevant places, but I finally managed one! 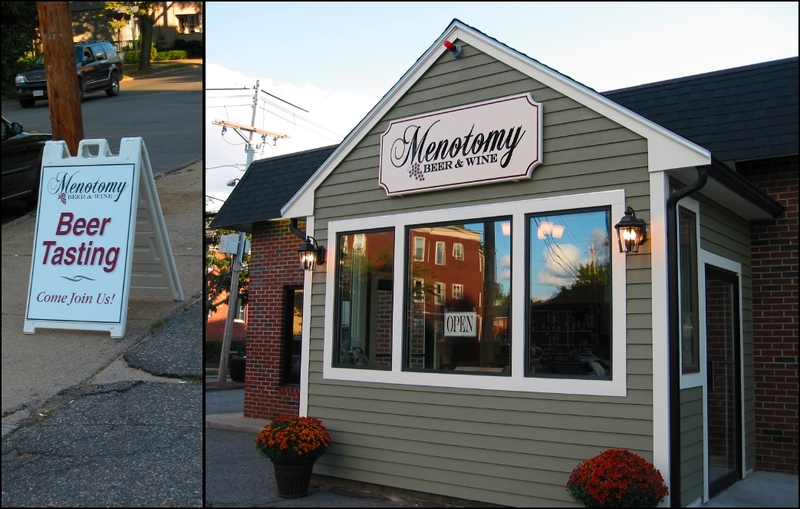 Menotomy Beer & Wine (for those of you who might have raised an eyebrow at the location) is the first store licensed to sell alcohol in the town of Arlington, MA since Prohibition. For those of you who’ve never lived anywhere near Massachusetts (or Utah), let me assure you that I Am Not Making This Up. For more context on Arlington, the Red Line ends at Alewife because back when it was extended, Arlington refused to slum it by allowing a stop within their hallowed borders. But I love Arlington. Living just a few blocks from the line, my walks often range into their territory and I’ve frolicked in Spy Pond more times than I count. And I love Menotomy Beer & Wine (hard liquor sale are still verboten), and the fact that I can walk there easily. Walking there is key because they host a weekly Beer Tasting (Friday) and Wine Tasting (Saturday), and I’m a lightweight. Last week’s were lovely, offering five beers and seven wines, respectively. I love these events because they offer the opportunity to try and learn about varieties that I would not likely be expose to otherwise, and there is usually at least one that I put on my list of things I should have more of. Details and more photos can be found behind the cut.